Premise: A couple in a strained marriage try to get away for a night at a dingy themed motel. The film begins six years after Dean and Cindy Periersa marry, and they are now raising their six year old daughter Frankie. Dean paints houses for a living, and Cindy is an ultrasound technician. After their family dog is run over by a car, and the strain in their marriage becomes eminent, Dean pushes his wife into spending the night at a seedy themed motel for some time alone. During and after a night of heavy drinking, the fissures in their relationship finally begin to crack. You know what makes this script so great to me? I could never write anything like this. The subject matter is foreign, and it's like a breath of fresh air. This isn't the first terrific screenplay I have read recently, but it is the first recently screenplay hat has challenged me. 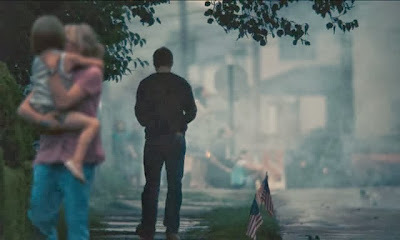 Blue Valentine is a brief read, but not a word is wasted; with few words, the writers convey enourmous depth. The personality of the characters bleeds across the page with their every gesture. Like when Cindy (in a flashback) is sitting on the bus; all the other seats are taken, but her bag sits on the seat beside her. When Dean asks to sit beside her, she reluctantly moves it. This is a small detail, but really does reveal a part of who she is. And then there's Dean at the motel, the morning after his drunken brouhaha. He wakes up on the floor, very hungover, to the sound of the phone ringing endlessly. After yelling angrily, he finally picks it up, and the other voice a prerecorded wake-up message. Dean, calm, merely says thank you, and hangs up. Even Cindy's parents, who are seen more than once but don't ever do anything, have dialogue that is rich with personality; history, thoughts, worries, hopes. The best part about all of this is that it's not something one can be taught in school. It doesn't matter how wealthy you are; you couldn't pay Shakespeare to teach you to write like this. Because this-the best material-comes from the depths of one's heart. Sure, anyone can go to school, make a name for for themselves, write an acclaimed film, win an Oscar. But works by people who have always had it easy, who have never struggled, will always be lacking something. And they will never be as good as the genuine works. Screenplays like Blue Valentine cannot be manufactured; they come out in an unrelenting torrent of emotion. Luckily, the writers of Blue Valentine also have the minds to articulate the heart. They show true discipline, focus, and intelligence. This all makes up for an unbeatable combination. This is what the work of masters looks like. Near the end of the film, Dean shows up intoxicated at Cindy's work, and causes a violent scene. (This puts the final nail in the coffin of their marriage.) At one point during this scene, Cindy perfectly summarizes her feelings to Dean: "I’m so out of love with you. I’ve got nothing left for you, nothing, nothing. Nothing. There is nothing here for you. I don’t love you..." Dean responds with: "I couldn’t drive you crazy unless you loved me..." And they're probably both right. The fact that it's a paradox supports the logic; real people are contradictions. This is the genius of Blue Valentine. No matter how hysterical anyone acts, no matter how angry, or hateful, or broken, or spiteful they are... to themselves, their feelings are valid. And to the reader, everyone's rationale is clear. After the scene in the office, out in the parking lot, Dean (fuming) pulls off his wedding ring and throws it into a field. Moments later, he goes into the field, frantically looking for it. Dean thinks, then acts. He gets angry, then gets angry at himself, for getting angry. He's terribly sensitive, and terribly terrified. In the next scene, he summaries himself exquisitely: "Baby I’m just fighting you know, fighting for my family. I don’t know what to do, I don’t know what else to do. Tell me what to do, tell me what to do [...] Tell me how I should be." Every man faces the same struggles as Dean; but Dean is so sensitive, he cannot help but externalize his internal emotion. 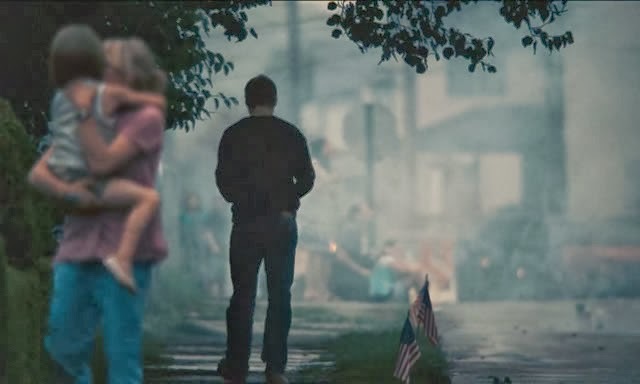 Melancholic and genuine, Blue Valentine is a gem. About: Made into a film, released in 2010. Directed by Derek Cianfrance, featuring Ryan Gosling and Michelle Williams.